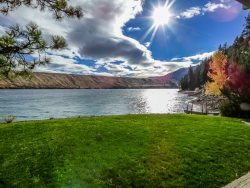 Wallowa Lakes Cabins | Wallowa Lake Vacation Rentals | Vacation lodging at Wallowa Lake | Private cabin rentals located at the resort side of Wallowa Lake. These properties are within a quick walk to all of the activities at Wallowa Lake's resort side. Be within walking distance to the Wallowa Lake Marina and boat launch, Wallowa Lake Tramway, or the Scenic Meadows Put Put Golf, the Matterhorn gift shop and miniature golf, Vali's Restaurant, Russell's Restaurant, dining at the Wallowa Lake Lodge and many other shops at the resort (busier) side of Wallowa Lake. This is also the area that the Aneriod Trailhead takes off from. Sit out on the patio and watch the fish swim in your trout pond!